In the mid 1970s video poker was invented. by 1976 the first black and white video poker machines appeared. They were superseded 8 months later with a color version. Nowadays video poker is one of the most popular casino games. A winning hand is paid from a fixed return. The payout's for winning hands are displayed on the machine. The higher the ranking of the hand, the greater the returns are. The payout's vary depending on where the game is played. 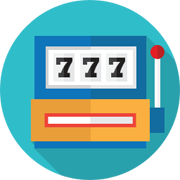 Video poker differs from a traditional game of Five-Card draw in a number of ways. There is only one player do it is not necessary to beat other players hands. Types of Games There are a number of different types of machines with slight variations in the rules. The most popular games are jacks or better, deuces wild and joker wild. Games can also be played where there are numerous hands at a time up to 100 hands. The returns for a royal flush on some machines are fixed, on others there are progressives. So be sure to look at the pay table before playing. How to play The aim is to make the highest ranking poker hand possible that is in the payout schedule displayed at the top of the hands. The player places wagers before cards are dealt. A standard deck of 52 cards is randomly shuffled and dealt (note some microgaming casinos offer wide poker with more then on deck). The player receivers a five card hand. The player then has the opportunity to improve the hand by discarding cards and being dealt new ones. The player decides which cards to keep and clicks the corresponding hold button, or the corresponding card on the screen. A hold may be canceled by clicking the hold button a second time, or by click the card a second time. The player may keep all the cards or discard any number of cards they wish. It is possible to be dealt a winning hand with the initial five cards. Microgaming helps the player by automatically holding the best cards, you may of course discard these cards by clicking them. Ranking Hands Hands are ranked in the same way as five-card draw. 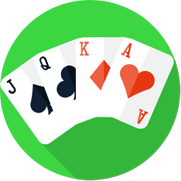 For games where there are wildcards, there are additional hands that include the wildcard, such as five of a kind A royal flush made with a wild card is considered a lower ranking hand then a regular royal flush. Wild Cards A wildcard is nominated card that can be used in the place of any other card. For example, the two ways may be declared wild. If you needed an ace to make up a hand you could use a 2 instead of an ace. Alternatively, a joker may be wild. By choosing a video poker game with wild cards it allowed higher ranking hands to be achieved. Jacks or Better Jacks or better is the most popular game. To win you need to get a pair of jacks or better. Deuces Wild With deuces wild games, all twos are wildcards. This means that when you get a 2 you can use it to represent any card. If you example, you have three aces and a 2, the hand held will be four aces. Because there is a greater chance of getting a ranking and, only hands of three of a kind or better win. Joker Wild In the game of joker wild, and additional card of a joker is added to the deck making 53 cards. The joker is a wildcard. The additional joker makes it easier to achieve higher ranking hands, which is reflected in lower payout odds then jacks or better. You also need to get a higher hand to win. Your need at least two pair or better to win. Winning Combinations Here you will find Winning Poker Combinations. Of course there are different combinations of cards will result in a win. Use this as a guide to learn the different ways to win.